Max! 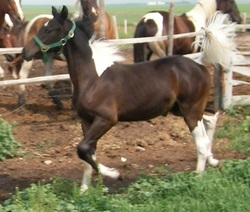 2010 brown (dark bay, almost black) tobiano Pinto colt. Beauty, brains, motion, conformation at it's best! 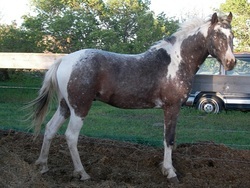 Sire is black/white Pintaloosa. Dam is stunning, absolutely beautiful! 4th generation our bloodlines through dam Prada NV (Jovani x Phantasy Island NV) Phantasy Island NV (Whispering Wind Flashy's Thunder x Strikingly Charming) Strikingly Charming (Bold Strike V x Magnums Charmer). 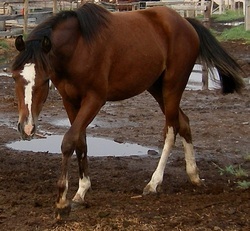 $750 only because he has a hernia (which has always gone away on any foal that I've had in the last 30 years). The world's BEST right here! 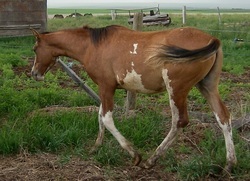 Sky Blue is a bright tobiano/Appaloosa 2008 colt. 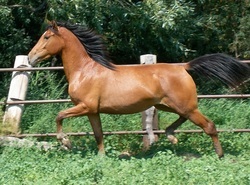 He is available as a gelding to the buyer who wants to stand out! 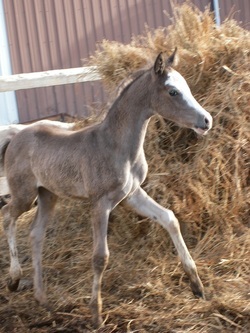 He's bay tobiano with blue eyes and Appaloosa markings all over his body. To top it off, he has huge eyes and a dished head. There is no other like Sky Blue - he is fantastic! Contact for Price.